The very first verse in Quran reads, "1:2 (Asad) All praise is due to God alone, the Sustainer of all the worlds (that exist)," and the very last chapter opens with this line, "114:1 (Ali) Say: I seek refuge with the Lord and Cherisher of Mankind," and there is a whole lot in between. God chose to address the entire mankind, and rightfully so. 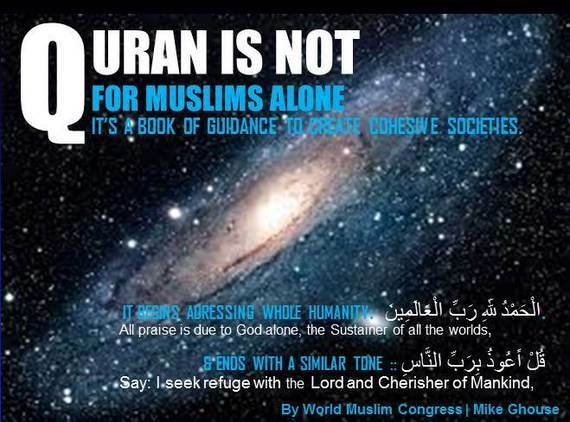 Quran is for the whole humanity and not just Muslims exclusively. Hold your breath, I cannot pack the next 1200 words in one single sentence, or utter it in one single breath, but I promise you a better understanding by the end of this essay. First of all, God is not the God of Muslims and no where he claims that in Quran. He is creator of the universe(s), which is within and beyond our imagination. Quran is a book of guidance to preserve the cohesiveness within and what surrounds us; people and the environment. Darwin is right about survival of the fittest. Nothing in the universe will survive if it goes off balance and is not intact. Thank God everything is created in balance and harmony (55: 7-13) with billions of other elements interconnected and interdependent on each other to function cohesively. In fact, the entire creation can be broadly classified into Matter and Life. Planets, stars, seasons and plants are programmed to function obediently (55:5-6) with precision, whereas humans were not put on an auto-pilot, they were instead given a free will to manage and maintain their own balance, and of course there was the guidance for everyone. God's says (49:13) that he has created us into many tribes, communities, nations and by extension faiths, ideas, shapes, and colors -- and all of us can trace back our origins to a singular couple referred to as Adam & Eve. Given that diversity, we are bound to have conflicts and compete for the resources. So, he adds, the best ones among you are those who will take the time to know each other, he knows that knowledge leads to understanding and understanding to acceptance and appreciation of different points of view. God does not miss a beat in communicating with his creation, and tells us not to compel others to be like you (2:256) let it come from their hearts for common goodness, and let others be others and you be you (109:6). Indeed, when you respect the otherness of others, and accept the God given uniqueness of each one of us, then conflicts fade and solutions emerge to live in harmony. By the way, this is my definition of Pluralism. Had he willed, he could have made us all into a single community or created all of us precisely alike (5:48), but he chose to create each one of us to be unique with our own thumb print, eye print, DNA, taste buds, belief buds, races, nations and ethnicities. God loves us all, and n0 one is deprived of his love; he has reached out to every human through a peace maker, messenger, prophet, reformer, a wise man or simply a good friend that brings sense to living. The creator offers a variety of guidance to the mankind, no matter where you live, the guidance is there, the guidance that leads to live in peace, and without fear of the other. He says I have sent a peacemaker to every nation and every tribe. What does God want? Like a mother who wants her children to live well; a teacher who wants his students to do well; and the chef who wants his patrons to enjoy his food.... God wants every one of his creation to live in harmony. He emphasizes the idea repeatedly (over 18 times) -- if you take care of his creation (neighbor), you need not worry; your rewards are with him. Just to make sure we understand this precisely, he says, whether you are a Jew or a Christian and by corollary other, if you take care of your neighbor, I will take care of you (2:62). Mind you, he is very clear, he has never said, "Muslim Neighbor," but just neighbor to be inclusive of all humanity. The concepts of universalism are loaded in the phrases like God of the Universe, "Rabbul Aalameen" and Mercy to Mankind "Rahmatul Aalameen "as Prophet Muhammad is called. Indeed, the word Aalameen is the mother of the word inclusion, aka Pluralism. We have reduced Islam from a system to create harmony and peace in the world to an exclusive political entity, copyrighted and owned by the group. Please beware of the mistranslation and misinterpretations. Deeper study will lead any one to realize the Quran had been purposely mistranslated down through history. In the middle Ages, European leaders commissioned a hostile Quran translation to foster warfare against Muslim invaders (Monastery of Abbot 1143 CE). Later, Muslim leaders (Hilali Khan 1924 CE) produced another translation to inflame Muslims against Christians and Jews. It was all for politics. Thank God for the efforts of countless people, most of the mis-translations have been fixed since 2012, and I have contributed my personal share of work towards that effort and I will be happy to do a full presentation on it if needed anywhere in the world, one of them was done in Melbourne, Australia in 2009 at the Parliament of World Religions. Dr. Tariq Ramadan and I also presented the same topic again in tandem. Don't panic, everything has checks and balances, as a seeker of the truth, you will look at least three different translations to grasp the inclusiveness of Quran. I recommend the translations by Muhammad Asad, Abdullah Yusuf Ali and Marmaduke Pickthall, they are not perfect but by far the best. Dr. Laleh Bakhtiar has fixed a few misogynistic translations in her work that were not handled earlier. More work needs to be done and God willing it will continue. I want to acknowledge the contributions made by Mr. Farooq Khan and Dr. Rehana Kausar of Texas, who convinced the Muslim establishments to accept and promote Muhammad Asad's translation and have distributed many on their own. Once they bought the entire stock of books and freely distributed to right people. Farooq Khan adds, "Only through these translations Muslim and Non-Muslims, both, can have a true glimpse of what the Holy Quran says." Thanks to CAIR for providing me some of the copies of Asad translations which I have personally given to pastors, Rabbis, Sikh and Hindu educators and even some Imams. A copy was also presented to my friend Sean Hannity - a great American (unless you know about him, you may not believe until you hear from me), Pamela Geller and others with a similar but one paragraph note as above. Yes, I have copies of Bible, Torah, Bhagvad Gita, Book of Mormon, and Book of Jaina, Guru Granth sahib, Kitab Aqdas, Rev. Moon's World Scriptures and 12 Quran translations. Thanks to friends and Muslims from around the world for the encouragement they have given me in moving forward with presenting Quran as a document of pluralism. It is a manual to create cohesive societies and it is for all, don't let Muslims monopolize it.